After high school graduation in 1952, both headed east to the mainland as Guard enrolled at Stanford University while Shane entered nearby Menlo College. Nick Reynolds attended Menlo after stops at the University of Arizona and San Diego State. During a particularly dull accounting class at Menlo, Reynolds noticed a student dead asleep and later introduced himself to Bob Shane. "He nudged me and said, 'Hey, I'm Nick Reynolds -- have you got a car? Mine just blew up.' . . . We started singing the first day we met," Shane remembered. (2) Reynolds, from Coronado, California, cut his musical teeth singing at family sing-a-longs as his father, a Navy Captain, had an affinity for old folk songs. With mutual interests of hanging out, drinking, chasing coeds and playing music, it wasn’t long before the duo became popular at parties with Shane on guitar and Reynolds on bongos. Within a few weeks, Shane introduced Reynolds to Guard. With the background in Hawaiian music perfect for backyard luaus in Northern California, the group pooled their talents and worked the lush lawns in the neighborhoods of Palo Alto. Adding a few nights a week working at a local bar, the trio seemed destined for a career path. Billed as Dave Guard & The Clypsonians, none of three at that time had aspirations for a show business career and the group disbanded. In late 1956, Shane returned to Hawaii to work at his father’s sporting goods store during the day and sing solo at night. Meanwhile, Guard and Reynolds added bassist Joe Gannon and singer Barbara Bogue and worked as The Kingston Quartet. At a gig in Redwood City, Guard met Frank Werber, a publicist from San Francisco who had heard of the group through a local entertainment reporter. Werber liked their raw energy but found their stage presence unrefined. Guard took the assessment as constructive criticism and invited Werber to a performance a few weeks later. Sufficiently impressed, Werber agreed to manage the group with one caveat. They had to replace Gannon. Bogue left the group with Bannon, which opened the door for Bob Shane, who had returned from the island in early 1957. They rechristened themselves as The Kingston Trio. 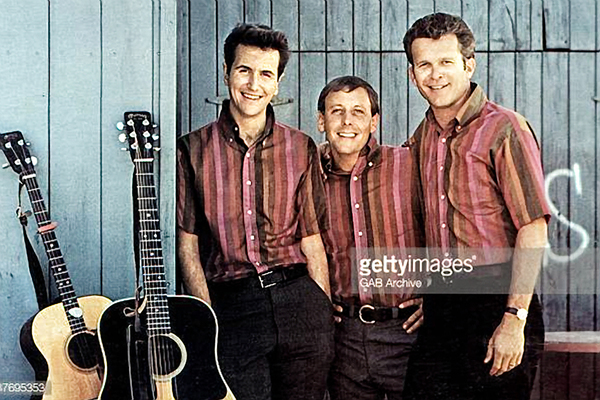 The group turned serious in early summer of 1967 when they met at Werber’s office to sign a contract making Guard, Reynolds, Shane and Werber equal partners in the venture of the Kingston Trio. Werber, now the manager, insisted the group rehearse up to eight hours while employing a vocal coach to help preserve their voices. During these sessions, the group worked not only on an eclectic array of songs, but the delivery of the supposedly spontaneous banter between the songs. Yes, the Kingston Trio rehearsed their ad-libs. Their first big break came in late June when comedian Phyllis Diller cancelled a week-long engagement at San Francisco’s Purple Onion. Werber convinced the club owners to give the untested group a chance. The club owner agreed and the trio covered Diller’s contract for the week of June 25-July 2. Dave Guard seized the opportunity and went the extra mile sending postcards to everyone the group knew to publicize their appearance. (4) Accordingly Werber took the time to plaster handbills about the city announcing the Trio’s appearance. (5) Those efforts, along with the months of preparation, paid dividends. The reception was so strong they were brought back the following week. The two-week engagement turned into a five-month stay from June through December of 1957. L-R: Dave Guard, Bob Shane and Nick Reynolds. With David “Buck” Wheat as the bassist (he would eventually be hired full-time), the trio headed into Capitol Records studios on February 5, 1958. They put to tape seven songs, one of which would be their only #1 hit, Tom Dooley. L-R: Bob Shane, Nick Reynold and Dave Guard. All looked well for the Kingston Trio. 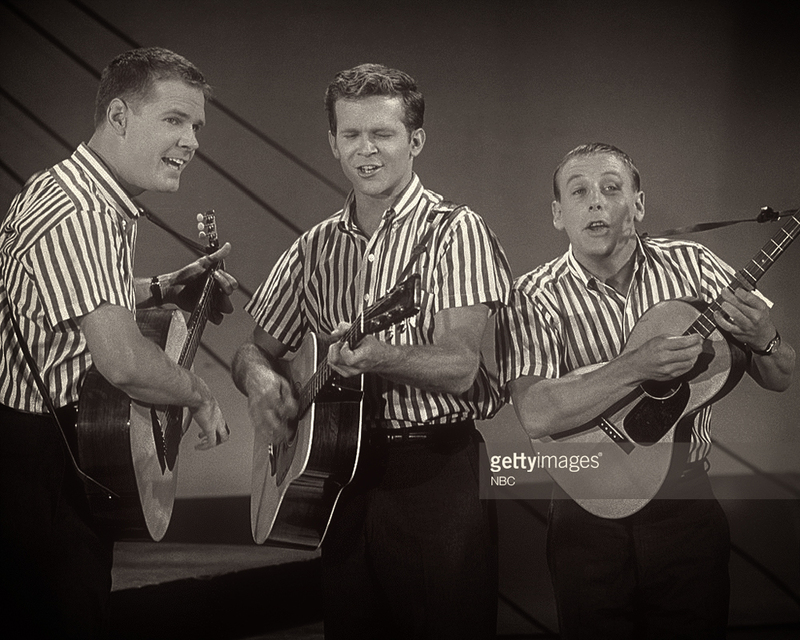 For five consecutive weeks in November and December 1959, four Kingston Trio albums ranked in the top ten of Billboard's Top LPs chart, an accomplishment unmatched by any artist before or since. 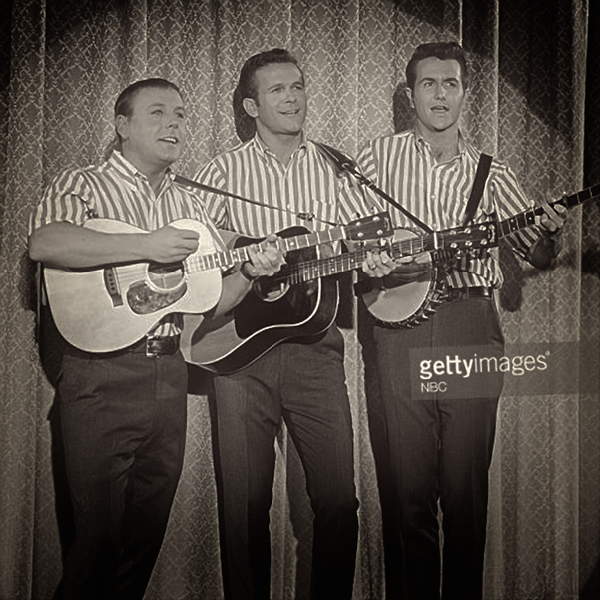 (12) The Trio also charted several single records during this time, made numerous television appearances, and played upwards of 200 engagements per year. But there was a rift in the making. The group found Guard’s replacement in the person of John Stewart. The Trio knew him as a songwriter, recording two of compositions a few years earlier. Stewart was part of the folk group, the Cumberland Three, a folk trio that used many of the Trio’s songs in their act. So, he knew the songs note for note. When Guard made plans to leave the group, bassist David Wheat decided to leave and join Guard with his next group, the Whiskyhill Singers. His replacement for the next incarnation of the Trio was Dean Reilly, a jazz bassist who had worked with Frank Sinatra, Ella Fitzgerald and Peggy Lee. John Stewart was selected to do the lead vocal. But Stewart didn’t like the song and had to be convinced to do it by Voyle Gilmore. So, it’s Stewart who sang and spoke the recitation while the background voices included Shane, Reynolds, road manager Donnie MacArthur and Glen Campbell. L-R: John Stewart, Nick Reynolds and Bob Shane. The LP, The Kingston Trio #16, was released on March 4, 1963 (8) and entered the Billboard Album chart on March 30th where it stayed for 29 weeks peaking at #4. (10) Normally, a single precedes an album release but Capitol presented a different strategy. Release the LP and let the radio stations choose the next single based on listener requests. Capitol’s strategy worked but not quite in an orthodox manner they would have guessed. William Idol, a high school English teacher in Chicago, wished to teach his class about how a vocal minority can shape public opinion, an idea presented in a then-current book, Profiles In Courage by John F. Kennedy. Idol asked his students to choose what they considered the worst and most obscure cut from a current record album and flood Chicago’s top radio station, WLS, with calls requesting the station play the song. The class’ choice for the experiment was Reverend Mr. Black. On March 18th, the station was deluged with calls to play the song. WLS was a Midwest powerhouse blanketing a number of states, which gave the station a great deal of power in determining the fate of a record. If WLS said a song was a hit, it was a hit. Within 48 hours, the station asked Capitol to release Reverend Mr. Black as a single. Toward the end of 1963 and the start of 1964, interest in the group had lessened. Desert Pete, their next single, was released in July of 1963 and reached #33. (9) Only one of their next three singles landed in the Hot 100. Album sales fared a bit better as the follow-up to #16, Sunny Side landed in the Top Ten. Many reasons could explain the slow fade from the top. Imitators such as Peter, Paul and Mary were gaining notice because they sang songs of protest, something the Trio refused to do. The British Invasion saw musical tastes change. Also, the Trio’s seven-year deal ran out and with the sales of acoustic folk albums declining, Capitol’s main focus turned to the Beatles. The Kingston Trio signed with Decca Records but none of the four albums produced by the new label sold well. In 1966, Reynolds announced he wanted to pursue a solo career. So, the group developed an exit strategy. From the middle of 1966 to June of 1967, play as many dates as possible and finish in style at the Hungry I, where they would come full circle. 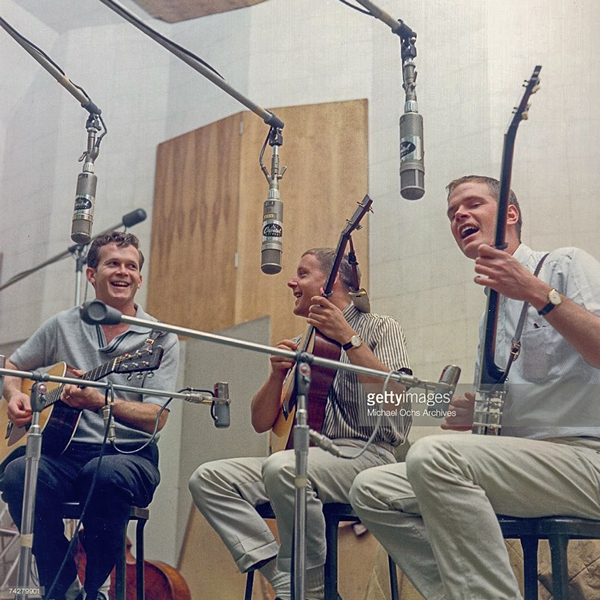 The last performance of the second iteration of the Kingston Trio was on June 17, 1967. Dave Guard founded the Whiskyhill Singers in 1961. The group disbanded in 1962. Dave and family moved to Australia in late 1962 where he recorded and performed until 1968. Returning to the mainland, Dave continued to perform, recording a live album at Pasadena’s Ice House in the 70s. In the 80’s, he played and taught music. On March 22, 1991, Dave died from cancer at age 56. Nick Reynolds moved to his ranch in Oregon after the Trio disbanded where he worked his ranch and returned to another passion, motor racing, through 1987. In 1988, he rejoined the Trio, working with Shane and George Grove, through 1999 when he retired again. Reynolds and his wife moved to his hometown of Coronado, California in 2000. He worked with John Stewart in a Kingston Trio fantasy camp held annually in Scottsdale, Arizona for eight years. He passed away on October 1, 2008 from acute respiratory disease. Bob Shane decided to stay in entertainment as a solo artist for two years. Preferring work in a group, he leased the Kingston Trio name with an agreement the new group would be the New Kingston Trio. Two troupes with the name performed—the first from 1969-1973 and the second from 1973-1976. In 1976, Shane secured the rights to the original name from Werber and Reynolds in exchange for his share of the copyrights and licensing rights to many of the group’s original songs. This formation of the group lasted from 1976-1985 with members Shane, Grove and Roger Gambill. Personnel evolved over the years as Shane retired from touring with the group in 2004 due to a heart attack. John Stewart pursued his career as a solo act. He was also a prolific songwriter. He wrote Daydream Believer for the Monkees and Runaway Train for Rosanne Cash. In 1979, he found success as a solo artist with the release of his album Bombs Away Dream Babies, which produced the top-ten hit Gold. In 2005 and 2006, Stewart joined with Reynolds and Shane at the Kingston Trio fantasy camp. On January 19, 2008, Stewart died of a brain aneurysm in San Diego at the age of 68. Pete Seeger sings Lonesome Valley which became the chorus of Reverend Mr. Black. There was no live video of The Kingston Trio performing Reverend Mr. Black available. 1) Blake, Benjamin, Jack Rubeck, Allan Shaw, The Kingston Trio On Record, July 1, 1986. 2) Lewis, Randy, Los Angeles Times, Nick Reynolds, 75, dies; a founding member of The Kingston Trio, October 3, 2008. Link. 3) James, Gary, Classic Bands, Gary James’ Interview With Bob Shane of The Kingston Trio. Link. 4) Bush, William, Frets Magazine, The Kingston Trio, June 1984. 5) Blake, Benjamin, Jack Rubeck, Allan Shaw, The Kingston Trio On Record, July 1, 1986. Page 19. 6) Blake, Benjamin, Jack Rubeck, Allan Shaw, The Kingston Trio On Record, July 1, 1986. Page 25. 7) Bush, William J., Greenback Dollar: The Incredible Rise of the Kingston Trio, 2013, Page 95. 8) Liner notes; The Kingston Trio: The Capital Years. 9) Whitburn, Joel, Top Pop Hits 1955-2002, Pages 385-386. 10) Whitburn, Joel, Top Pop Albums 1955-2001, Pages 460-461. 11) Wikipedia, Kingston Trio, Link. 12) Blake, Benjamin, Jack Rubeck, Allan Shaw, The Kingston Trio On Record, July 1, 1986. Page 37. 13) Bush, William J., Greenback Dollar: The Incredible Rise of the Kingston Trio, 2013, Page 130. 14) Bob Shane interview, Wherever We May Go: The Kingston Trio Story, DVD, 2006. 15) Bush, William J., Greenback Dollar: The Incredible Rise of the Kingston Trio, 2013, Page 233. 16) Moran, Jim, Comparative Video 101, Lonesome Valley/The Reverend Mr. Black, October 9, 2009, Link. L-R: Nick Reynolds, Bob Shane and John Stewart.